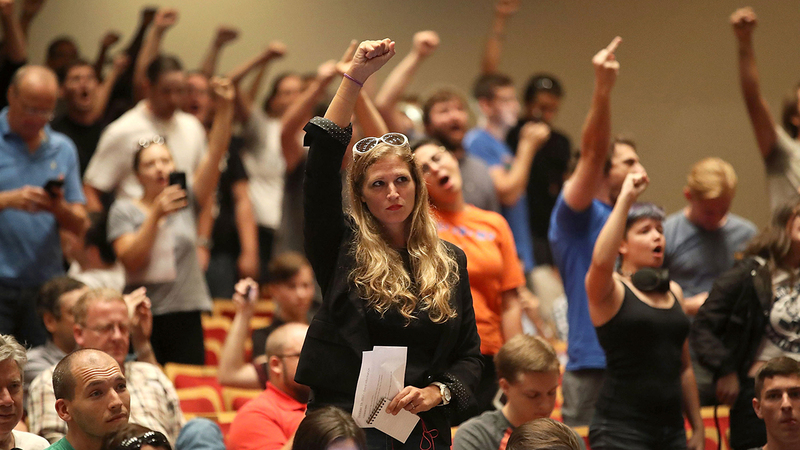 Students and residents mounted a peaceful protest at the University of Florida that threw Richard Spencer for a loop, exposing the hollowness of his message and the fragility of his ego. The police did their job. On Thursday, the venue was secure, disputes were contained and law enforcement quickly resolved the one incident that could have resulted in death or serious injury. But for Spencer, the outcome wasn’t exactly wonderful. Spencer and his cohorts demanded a platform in Gainesville — a tactic they’re using at colleges nationwide — by citing free speech, but they balked when attendees mounted a free speech protest of their own. The 700 tickets, distributed by Spencer’s National Policy Institute at the door at the last minute, went mostly to students and residents who opposed Spencer’s message. When Cameron Padgett, Spencer’s 29-year-old booking agent, took the stage to introduce the speakers, he was booed and heckled. The opening acts, Mike “Enoch” Peinovich and Elliott Kline aka Eli Mosley, kept their remarks short amid such resistance, sometimes yelling over the crowd as attendees drowned out their most offensive remarks. Spencer constantly refers to himself as a “dissident intellectual,” apparently hoping the label will stick. Since his early days in the spotlight, he’s tried to cultivate an image as a calm, reasoned — and even cultured — academic racist. A series of softball media interviews helped that effort along, treating him like a harmless curiosity instead of a virulent racist. But on the stage in Gainesville, faced with serious opposition, his thin façade crumbled. He got flustered when he realized the crowd would not back down. Then he resorted to insults. 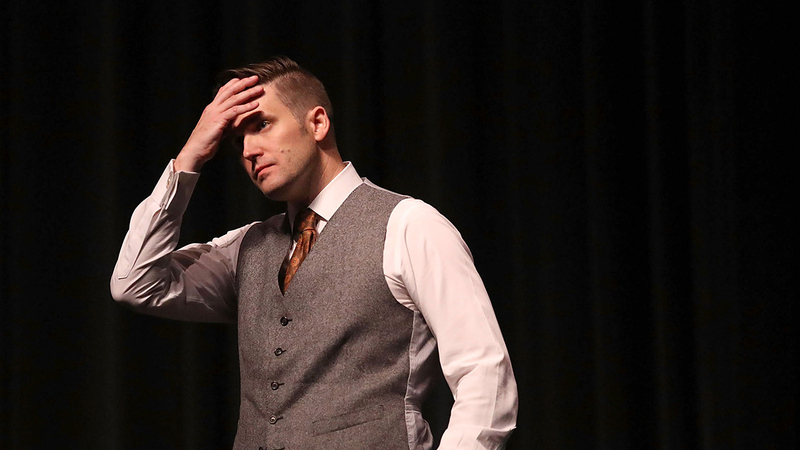 Richard Spencer became flustered when crowds chanted "it's your fault!" after the subject of Heather Heyer's death in Charlottesville arose. Spencer mocked them, displaying a stunning lack of self-awareness. One woman asked Spencer to take responsibility for the violence in Charlottesville. He flatly refused, and amid chants from the audience of “It’s your fault,” he called the circumstances of Heather Heyer’s death into question. The crowd at Richard Spencer's October 19 Gainesville speech. The event shed light on what Spencer and other white nationalists really mean when they talk about free speech. They aren’t talking about the law or the Constitution, they’re talking about hijacking the system and using it to amplify their message. From a legal standpoint, the university gave Spencer everything they could reasonably be obligated to give. He got a venue, $500,000 in law enforcement protection, and even control of ticket distribution when he demanded it. Unfortunately for Spencer, nowhere in the legal precedent on free speech does it say that when you go somewhere you know you are unwelcome, you have to be shielded from encountering rudeness. Nowhere does it say that an audience is legally required to sit silently and absorb every talking point you deliver, no matter how repugnant. Gainesville residents have free speech rights, too. And on Thursday, they used them. Joe Raedle and Brian Blanco/Getty Images.